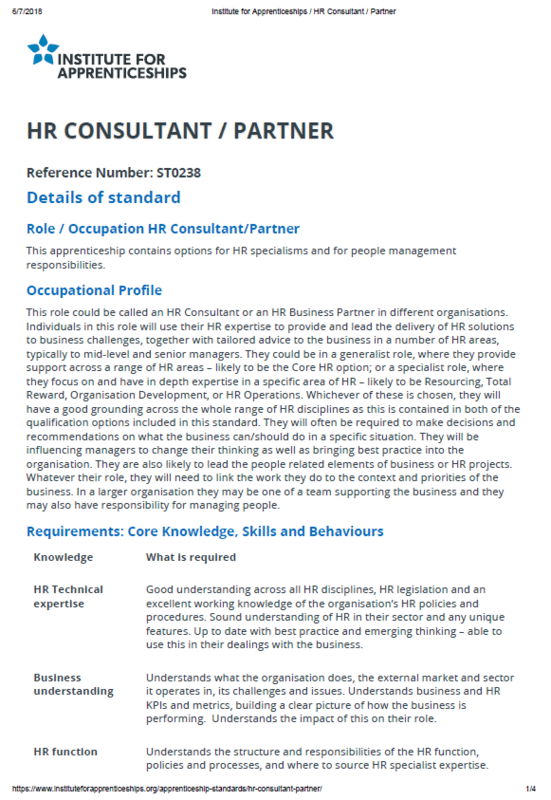 This role could be called an HR Consultant or an HR Business Partner in different organisations. Individuals in this role will use their HR expertise to provide and lead the delivery of HR solutions to business challenges, together with tailored advice to the business in a number of HR areas, typically to mid-level and senior managers. They could be in a generalist role, where they provide support across a range of HR areas – likely to be the Core HR option; or a specialist role, where they focus on and have in depth expertise in a specific area of HR – likely to be Resourcing, Total Reward, Organisation Development, or HR Operations. Whichever of these is chosen, they will have a good grounding across the whole range of HR disciplines as this is contained in both of the qualification options included in this standard. They will often be required to make decisions and recommendations on what the business can/should do in a specific situation. They will be influencing managers to change their thinking as well as bringing best practice into the organisation. They are also likely to lead the people related elements of business or HR projects. Whatever their role, they will need to link the work they do to the context and priorities of the business. In a larger organisation they may be one of a team supporting the business and they may also have responsibility for managing people.